I’m so flabbergasted by Swiss Army Man that I have to share this weird gem of a movie with you. It has all the feeling of an indie film, complete with cringe-y humor, kumbaya music, and a surprisingly profound meaning behind it all. 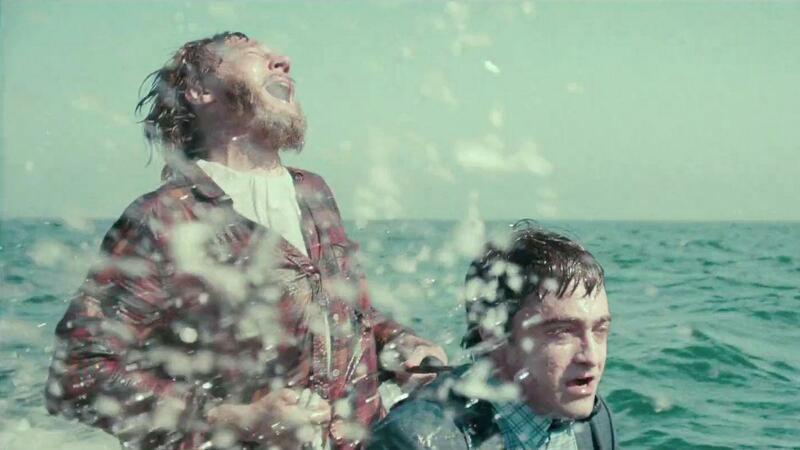 Swiss Army Man first appeared at the 2016 Sundance Film Festival before reaching world-wide release on July 1st of the same year. It popped up on my Netflix feed this week and the premise was just so ridiculous I had to try it. Plus, it has Daniel Radcliffe in it, so that’s a plus. Imagine a person named Manny who looks like Daniel Radcliffe and is as useful as a Swiss army knife. He can be struck like a match to make fire, gush water out of his mouth on command like Squirtle, and fart so hard and so much that he can be ridden like a jet-ski. Weird, but interesting. I’ll bite. Okay, now imagine this person is a talking corpse that can’t move on his own except to talk. That’s Swiss Army Man. No, I’m not kidding about the fart-jet-ski-thing. Image courtesy of A24. Pair this corpse with a guy named Hank who is stranded in the wilderness. He’s about to kill himself on a desert island when Manny suddenly washes ashore with all his crazy Swiss army powers to save the day. Seeing the corpse’s usefulness, Hank drags Manny around to try and get them both home, using Manny’s weird and amazing skills to get them out of messy situations. All the while, Hank uses his vivid imagination and amazing artistic skills to try and bring his talking corpse friend back to life. He creates elaborate scenes and costumes out of twigs and leaves to mimic the life Manny doesn’t remember. A bus full of people, a club full of dancers, a girl he might have been in love with. Maybe helping him to remember the people that loved him would get his heart started again. The music of the movie is at times a little too cliche, and other times it is perfect. During a montage, the song actually narrates what is going on in the movie. Now we are shooting some fish! Are we falling in love? This is a hilarious song, but you have to have subtitles on to really hear it because it’s so quiet and the accompaniment is so loud. I really recommend having subtitles on through the whole film because other things like this can be missed without them. How does this guy have all the time and engery to build these things? Image courtesy of A24. The acting is perfect. Daniel Radcliffe, aka Manny, somehow has a lot of personality for someone who can barely move their mouth, and nothing else. He can’t make expressions and one eye is always half closed. Hank, played by Paul Dano, is the complete opposite of Manny, and has a lot of expression both bold and subtle. Through lines of dialogue we clearly know what kind of person Hank is. Both characters are lively and feel real. The relationship between them is also interesting. You do get this feeling like something romantic is going on. Which is very weird to think about, so I won’t. Warm Bodies did zombie romance, so it’s probably fine. When I say this movie changed my life, I’m not kidding. As a fiction writer, a storyteller, and a person who just loves to hear a good story, this movie was something to behold. To make such a weird premise come to life and actually pull it off? Astounding. It’s painfully awkward at times, but it’s also strangely beautiful. We’re gonna die. That’s a thought. Everyone dies. I’m sorry if this makes me weird or you don’t understand, but I wish I was dead again. There’s several points in the movie where it tries to get all meaningful and just ends up sounding like high people talking about the meaning of the universe. It’s as funny to listen to as it is profound. Me telling you about how weird the movie is will not to do it nearly enough justice. So, if you haven’t watched it yet, do it. It’s on Netflix right now. What are you waiting for? Pry open those eyes and watch this movie already! Image courtesy of A24. Previous articleMythic Race Making World of Warcraft Great Again? A blogger that talks all things writing and nerdy. An author of realistic fiction and urban fantasy. A new streamer of survival and campaign games. A little bit zany, a little bit all over the place, a little bit just happy to be here. Agent of House Dimir. If you want some casino games, check this site and play with a special bonus! We are a community of passionate gamers. We are dedicated to the idea of bringing together diverse elements of videogame pop-culture into one, accessible site. We want our site to be the go-to place for videogame pop-culture content and discussion. This includes news, reviews, videos, tutorials and editorials among other elements. Our content is not just about video games; but about movies, books, comics, anime, hardware, cosplay, eSports and other videogame pop-culture related topics. © 2018 DVS Gaming | All rights reserved. All contents copyright their respective owners.